The tulip, with its bold, eye-catching flowers in a wide variety of gorgeous colours, is in bloom, in many of our spring gardens, making one of their most striking features. 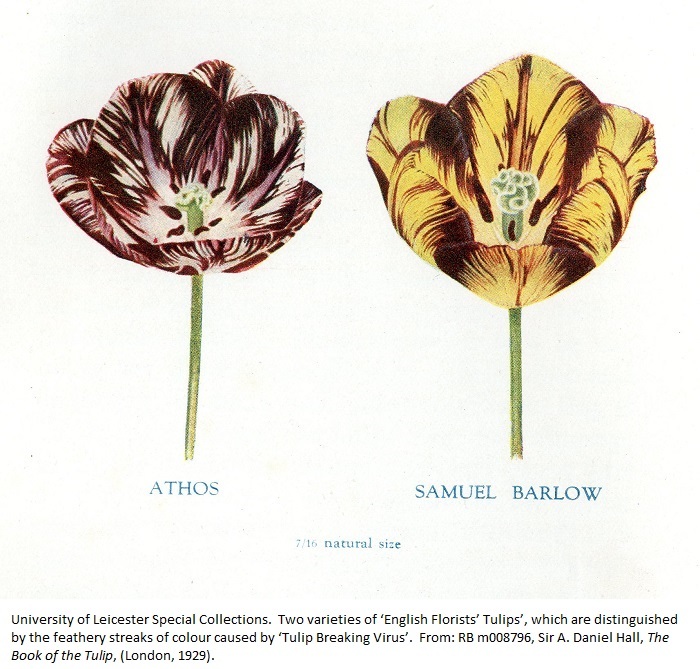 In common with many flowers, it has gone in and out of fashion over the centuries – but the tulip’s history has been more dramatic than most. 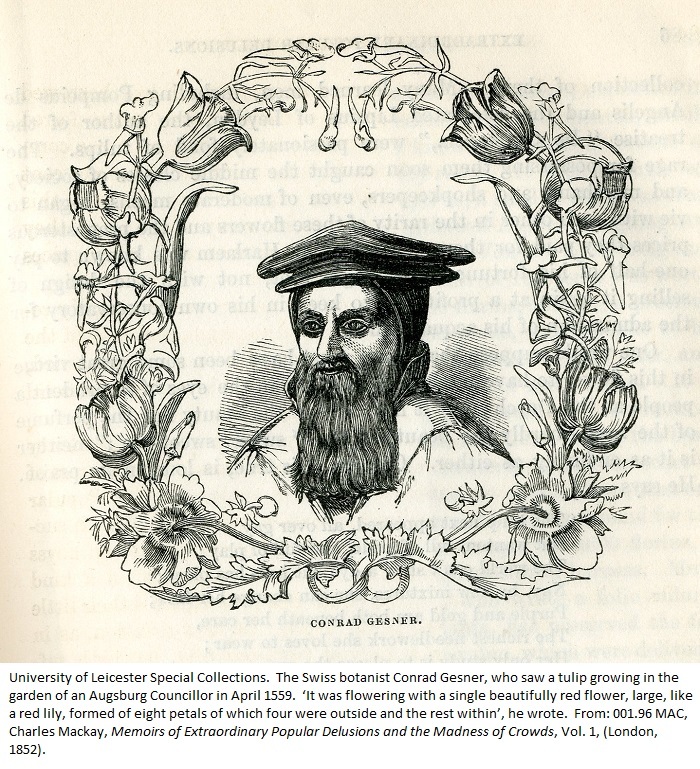 Clusius met De Busbecq in Vienna in 1572, obtaining tulip seeds and bulbs from him, and, in 1593 he took his tulips with him to Leiden, where (unsurprisingly, because of the huge prices he asked for them) some were twice stolen from his garden by night. 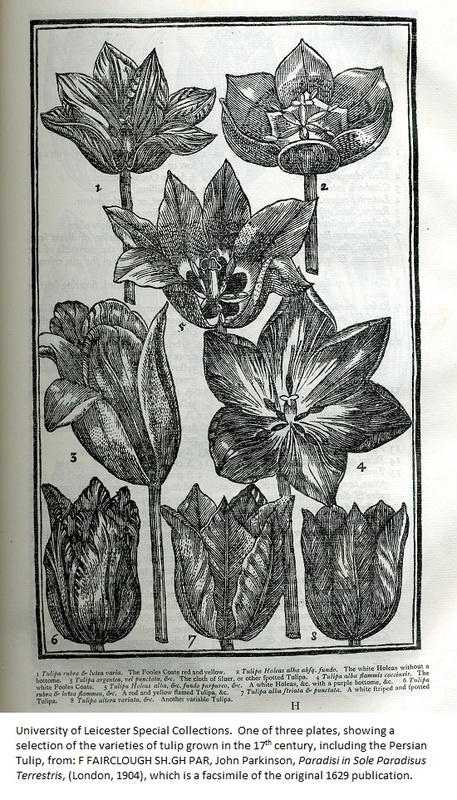 The popularity of these flowers, so startlingly different from any others known in Western Europe at the time, spread rapidly and the resulting ‘tulip mania’ or ‘tulipomania’ of the 1630s, during which tulips became a highly sought-after luxury item and status-symbol and commanded rocketing, eye-watering prices is well-known. Dutch growers vied with each other to produce a multitude of different varieties, especially those known as Bizarres, with their multi-coloured streaks. This phenomenon is actually caused by a virus, known as ‘Tulip Breaking Virus’ – but that was not discovered until 1928. Contracts to buy tulip bulbs at the end of the season were bought and sold in trading known as windhandel (wind trade), because no actual bulbs were exchanged and many of the traders in fact never even had one in their possession. Of course, this could not go on indefinitely and in February 1637 the ‘bubble’ abruptly burst. 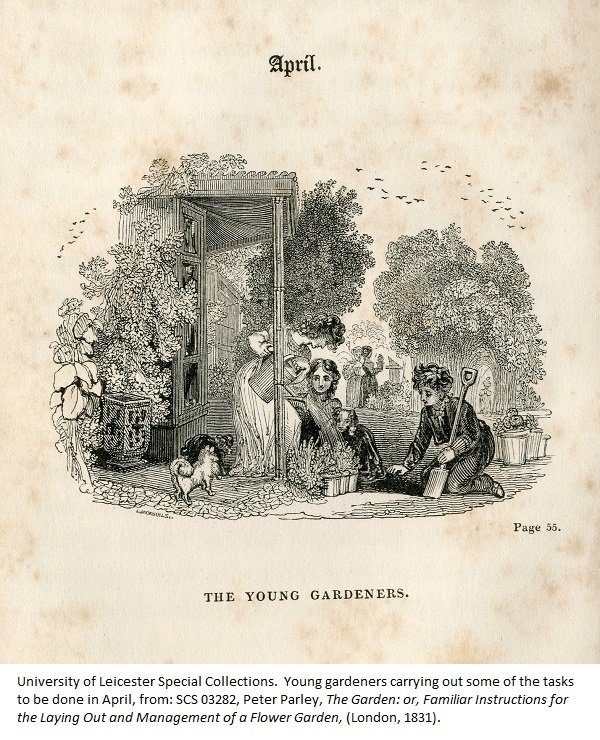 Discussion of ‘tulip mania’ has been heavily influenced by Charles Mackay’s Memoirs of Extraordinary Popular Delusions and the Madness of Crowds, originally published in 1841. 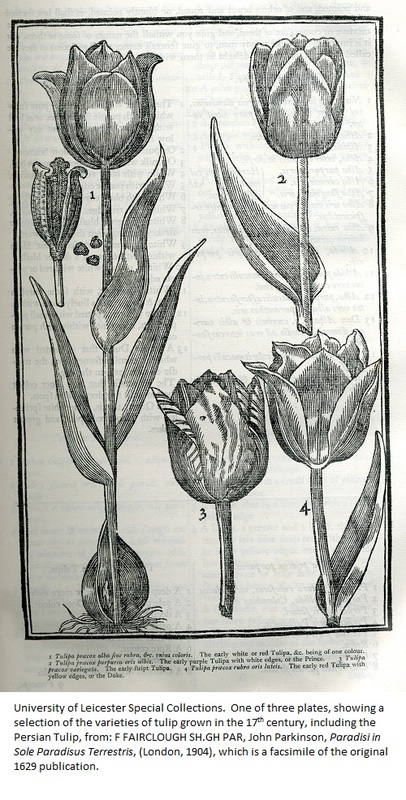 According to Mackay’s account, ‘In 1634, the rage among the Dutch to possess [tulips] was so great that the ordinary industry of the country was neglected, and the population, even to its lowest dregs, embarked in the tulip trade’3. 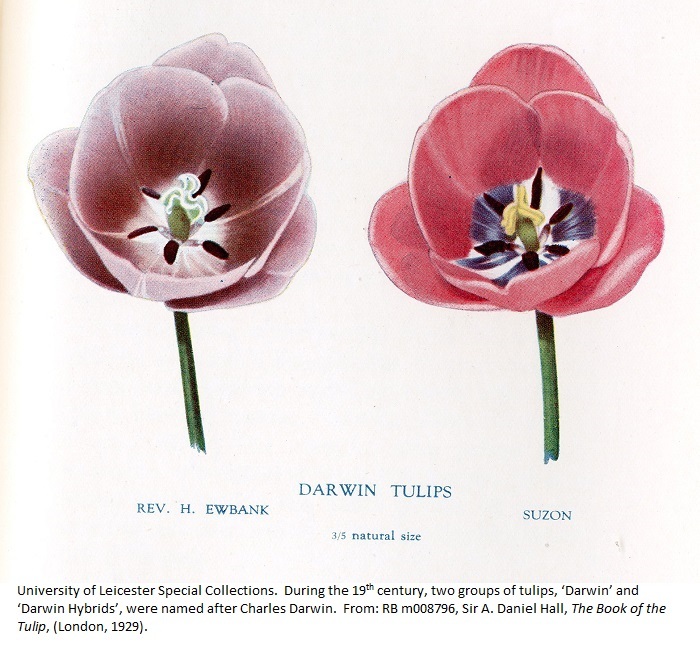 The theme of mistaking tulip bulbs for onions recurs in Mackay, with the story of a sailor, who, having been gifted a ‘fine red herring for his breakfast’ by a wealthy merchant, spied what he thought was an onion on the counter and ‘slipped it into his pocket, as a relish’, only to find later that he had, to his horror, eaten a Semper Augustus, worth 3,000 florins, which would have fed ‘a whole ship’s crew for a twelvemonth’4. 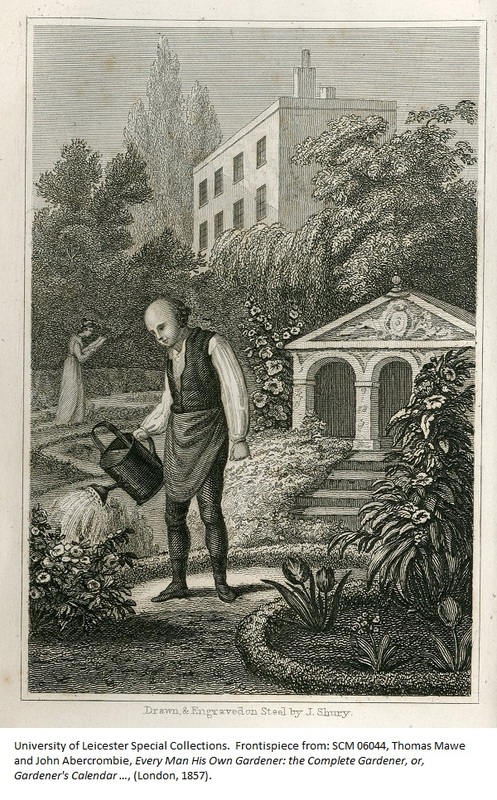 Modern scholars have disputed several aspects of Mackay’s account of the ‘bubble’, arguing that available evidence suggests ‘tulip mania’ was confined to a small number of merchants and wealthy craftsmen and that the economic fallout was limited. 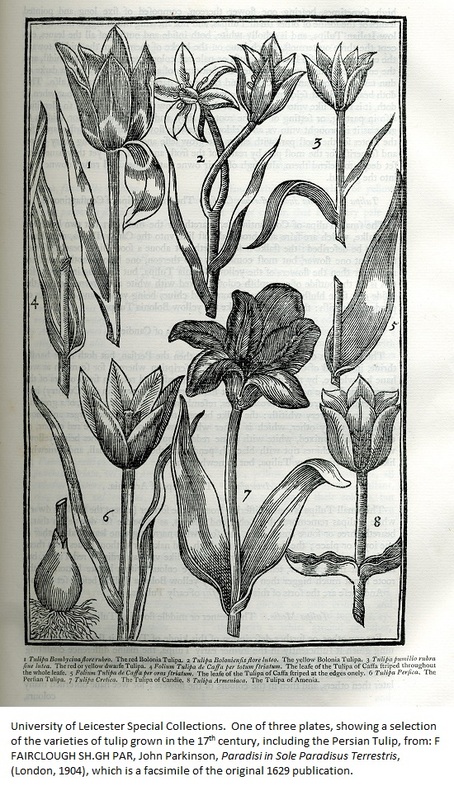 But, whatever the case, it is accepted that, in 1636/7, tulip bulb contracts did fall dramatically from their previously inflated prices. 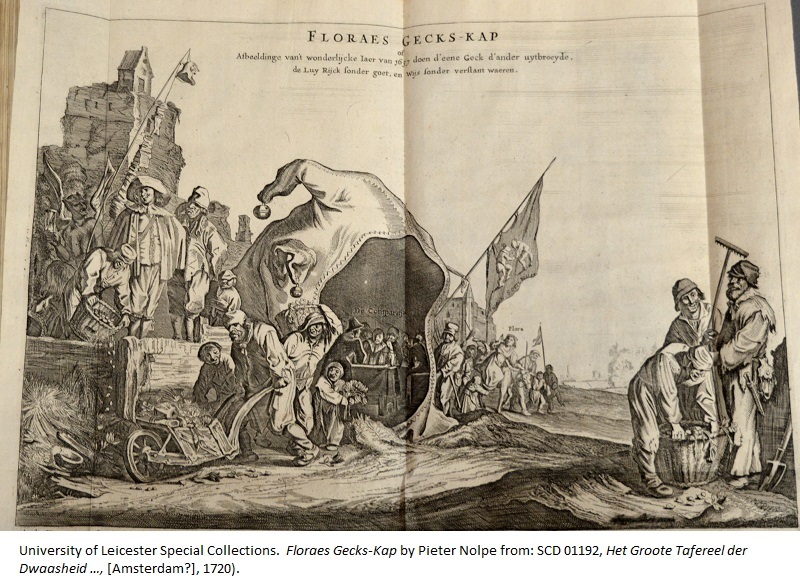 This print, Pieter Nolpe’s Floraes Gecks-Kap (Flora’s Fool’s Cap), first published in 1637, is taken from a 1720 volume in the Special Collections, part of the James Johnson Bequest, Het Groote Tafereel der Dwaasheid (The Great Mirror of Folly). This folio appeared in Amsterdam only months after severe stock market crashes in England, France and the Dutch Provinces and is a fascinating collection of material relating to the Mississippi, South Sea and other ‘Bubbles’, comprising a mix of satirical and didactic verse and plays, farces, pamphlets – and a remarkable wealth of topical images, mainly satirical and allegorical prints, but also maps and even designs for decks of playing cards. 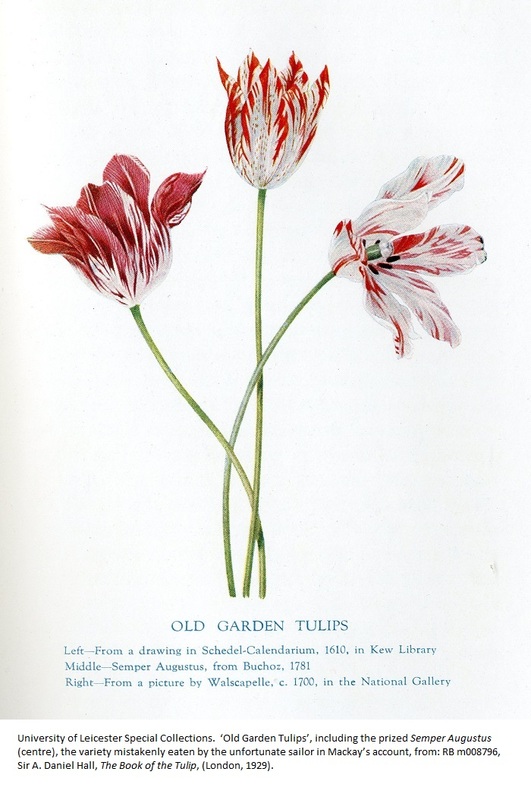 Floraes Gecks-Kap, which satirizes ‘tulip mania’, is reproduced in it, without alteration. In the centre of a rather barren landscape, is a tent shaped like a giant Fool’s Cap with bells, in which tulip traders with their scales are negotiating deals. 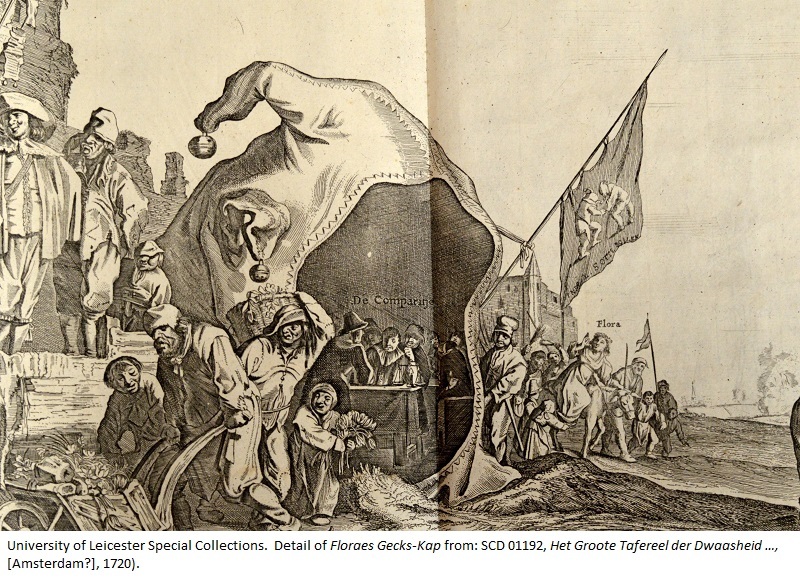 The flag hanging from the tent is decorated with two jesters wrestling. Outside, to the right of the tent, the goddess Flora (helpfully labelled), seated on a donkey, is being driven away by a group of angry peasants. To the left of the tent, growers are throwing a wheelbarrow and baskets full of tulip bulbs onto a rubbish heap. 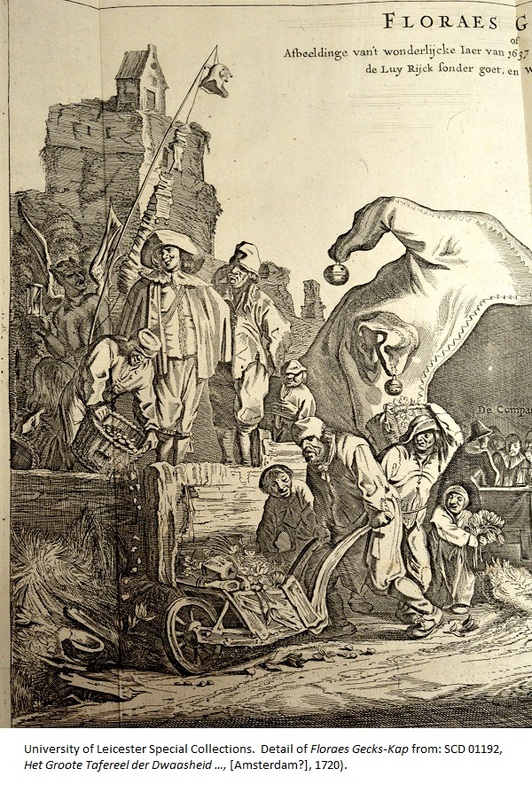 Behind them, stands a fashionably attired trader with a self-satisfied smile, who has clearly made his fortune from tulips, and next to him is a demon, holding an hourglass and pole, from which hangs a string of contracts for tulip bulbs and another Fool’s cap. Over the years since 1850, many growers have taken up this same challenge, but have not, so far, been able to produce a bloom completely without a purple or aubergine tinge – this quest, along with the search for other exotic new colourations and petal shapes, continues. My own concerns are much more prosaic – how can I deter grey squirrels from digging up the bulbs and picking and peeling apart the buds?